R&D Marble is excited to announce the launch of our new and improved website! Our upgraded website is an essential part of our ongoing effort to improve our products and services for you, our most valued customers. We’ve been serving Montgomery County and the surrounding areas for forty years– since 1979. Our company has become a leading stone supplier, fabricator and marble manufacturer with proven success. We are your primary source for kitchen countertops and bathroom surfaces. Whatever your needs are for your kitchen or bathroom surfaces, we have you covered. Choose from our natural stone, marble, and granite or engineered stone and composites. Our clients represent a wide range of people. We provide our services to building contractors, commercial contractors, and individual homeowners on new custom homes, kitchen, and bath remodeling projects, as well as commercial builds and remodeling. We’re also happy to help the do-it-yourself person or couple who prefers to do their own installation. We have a wide selection of materials to make your kitchen and bathroom look like they belong in a model home. 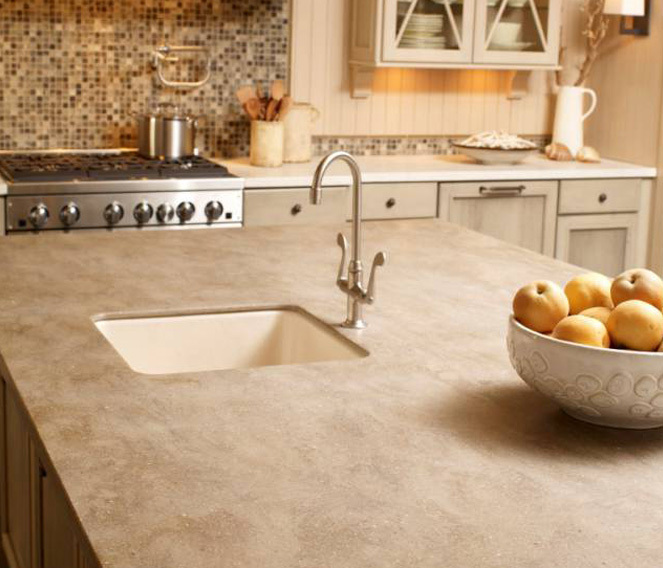 Whether you want natural stone, quartz, or solid surfaces for your kitchen countertops, we can help! If your bathroom is in dire need of a facelift? We can turn your dreams into a reality with our wide selection of design options. Our cast polymer products are beautiful and versatile. You can choose from our wide selection of cultured marble, cultured granite, and TruStone. The materials can be custom designed to match your interior design style. Whether your outsourcing your new countertops or bathroom or doing it yourself, natural stone (granite) is an outstanding choice. Considering its durability and longevity, granite is a perfect match for residential and commercial installations. It can even be used in your outdoor products. Quartz is an excellent eco-friendly choice for your interior installations. Not only is it environmentally friendly, but it looks absolutely stunning. You can choose from our Caesarstone quartz, Cambria, Hanstone, Silestone, Wilsonart, Viatera, and Vicostone. While solid surfaces have been around for five decades, they still are a popular choice for homeowners and contractors alike. While these surfaces look like natural stone, they aren’t porous like stone. They’re also durable and easy to repair. You can browse our wide range of solid surfaces including Corian surfaces, Livingstone, HI-MACS, and Wilsonart. Are you in need of a handicap accessible bathroom? We customize our cultured marble products to suit your needs. We can convert areas that weren’t handicap-friendly with our handicap accessible ramps and shower pans. We can convert showers, tubs, and walk-in tubs for your unique needs. Whatever your cultured stone needs, we are ready to serve you. Browse our services on our new website to find the best option for your project. Would you like to learn more about R&D Marble? Join the conversation to speak with our team of marble experts today!